Pivotal turning points for the American left are few and far between. The Progressive Era was just one of those moments and the book Constitutional Government in the United States was a lynch pin of the era. Before the Progressive Era the term liberal meant someone opposed to government involvement beyond what was absolutely necessary. Afterwards, the term meant quite the opposite. Woodrow Wilson, America’s only college professor president, exemplified what it meant to be a progressive and would come to define much of what it meant to be liberal. Most importantly, he gave the left a new weapon to be used in reshaping the world more to their liking. 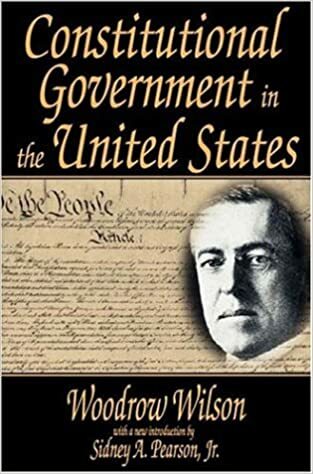 The Living Constitution was Wilson’s gift to liberal America, and the book the Constitution in the United States was the gift wrap it came in. When reading this work one is struck not by its radicalism, but to the extent it seems mundane even patriotic. Of course that is what Wilson was gunning for when he wrote it. He wanted the American public to see what he was saying as traditional and mainstream, which of course it was not. Betwixt the familiar tones he slipped in new ideas and radical new approaches to law. If one does not want to trudge through this book, than two quotes from reveal much about the philosophy it espouses and the man behind it. The first quote denotes the liberal elitist view, that only what is immediately practical sets the limits on how much control can be imposed on the general public. The second quote denotes much more. It sets on a premise of the first quote, there are no absolute principles, and expounds on it. It declares the law, and especially the constitution, are subservient to the changes in society. In short, whatever society wishes at the moment is right. (By such logic, the mass murder of Jews under Hitler was just as long as it had public support!) Accordingly, the constitution must be moldable to society and interpreted anew by each generation. Of course, generations do not interpret the constitution, judges do. So in essence, the law becomes whatever the person sitting on the bench decides it to be. In such cases there is no law, only the tyranny of the arbitrary. Constitutional government in the United States thusly set the world on its head, and created for liberals a new philosophical plank.